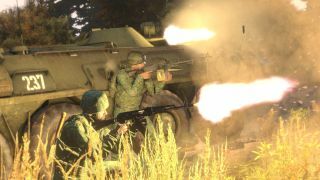 The "Make Arma Not War" contest ran for over a year, which might sound a bit ridiculous until you consider that Bohemia Interactive was offering €500,000 (estimated at $680,000 at the time, now worth about $546,000—such is the nature of international exchange rates) in prize money. Serious inquiries only, in other words. Bohemia announced the winners today, and they do look very serious indeed—with the possible exception of Get Wrecked, for reasons that will become clear when you watch the trailer. *These entries received an equal amount of points from the Make Arma Not War jury. The Health Care in Danger Award, created in conjunction with the International Committee of the Red Cross, went to Pilot Civilian Air Rescue On Missions, by RobJ2210. "On behalf of everyone here at Bohemia, I’d like to congratulate the winners, and thank all of the contestants, supporters, and judges for their enthusiasm and hard work," Bohemia Interactive CEO Marek Spanel said in a statement. "As developer of the Arma series, it’s very inspiring to see content creators bring such varied, creative, high-quality additions to the Arma 3 platform, as well as the passionate embrace of their efforts by the Arma community. The Make Arma Not War contest is an important first step in the promoting and rewarding of content creators, and we look forward to building upon this commitment in the upcoming year." Up-close looks at all the winners, including screens, trailers, and detailed descriptions, may be found at makearmanotwar.com.